When you hear profiteroles you normally imagine a slightly sweet choux pastry filled with a light cream and dipped in melted chocolate. Well this is a savoury version which works just as well and makes a great appetiser. Choux Pastry may seem complicated but like any pastry if you follow the recipe you will have no problems. All it takes is a little (actually a LOT) of elbow grease to make choux pastry. 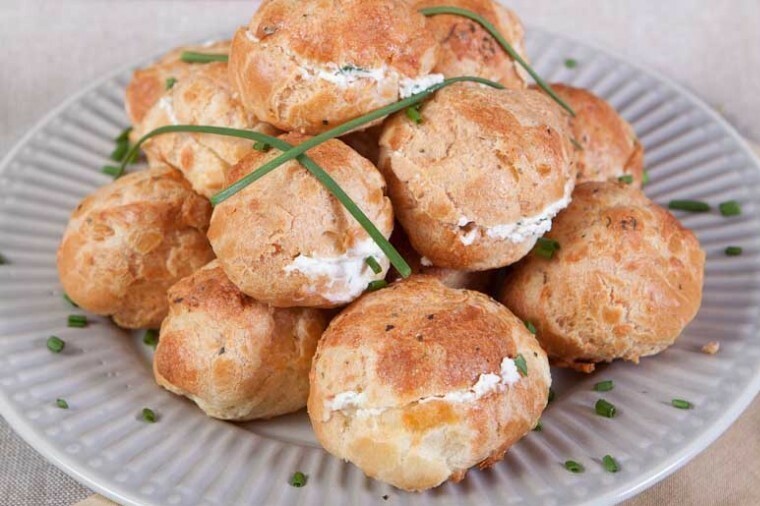 The choux pastry’s flavour is enhanced by adding herbes de provence to the mixture and also we grated some cheddar cheese into the mix. Later we also topped the pastry with some more herbs and cheese before baking. The cheese topping really allowed the savoury profiteroles to get a golden shiny finish and the herbs give a wonderful aroma. Now that you have the pastry done, the filling is the easy part. We chose the easy and quick cream cheese and chive option but what about a prawm mayo, cheese and spinach or good old egg mayo? To make the choux pastry: preheat the oven to 180 degrees C.
In a small saucepan, combine the water, butter sand salt and bring to the boil over a high heat. As soon as the mixture has boiled immediately remove from the heat and add the flour and stir quickly until smooth. Then return to a medium heat for a further minute to allow the flour to cook out, keep stirring until the mixture comes away from the sides of the pan. Add the grated cheese, herbs de Provence, mix well. Using a teaspoon or pipping bag, place approximately 3cm wide portions of the pastry on a greaseproof lined baking tray, leaving at least 2cm between portions (the profiteroles will double in size). 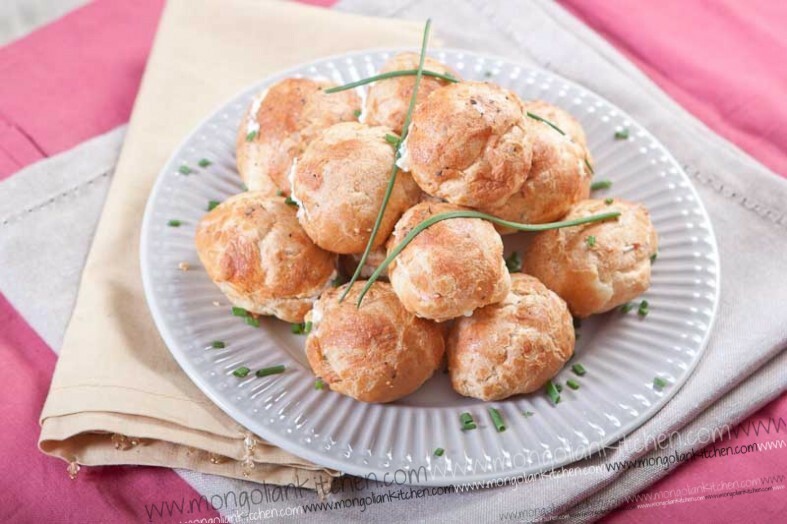 Sprinkle the grated cheese and dried herbs on each profiterole. Bake in the oven for 25-30 minutes until golden brown. 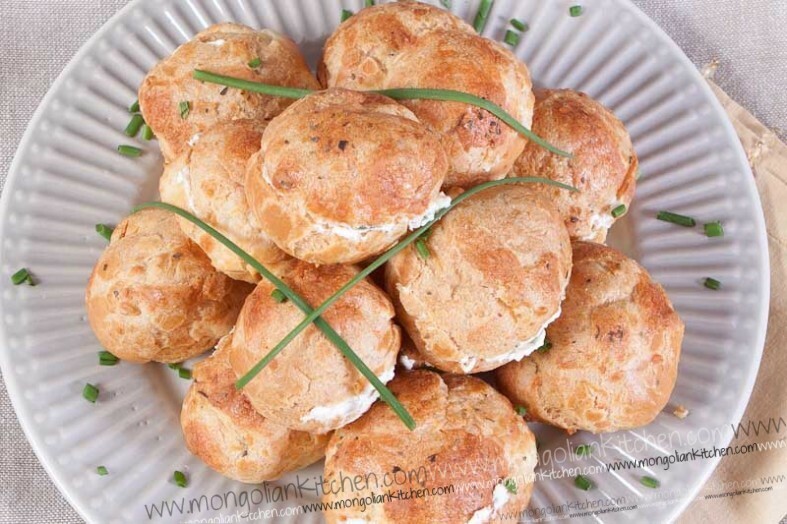 To make the cream cheese filling, mix the cream cheese with the chives and spoon into the profiteroles. Honestly, it errs me a little with savory choux. However, cream cheese and chive. I can imagine the goodness you’ve helped me discover! Shall try it out one day! I love profiteroles! Great idea to make them savory–it opens up so many possibilities. Yum! Love these savory profiteroles. Cream cheese and chives always rocks!! Great idea. I made some choux pastry yesterday for choux a la creme and had a bunch of puffs leftover. My first thought was a savory option and I am so glad that it exists!! I am making a filling with dairy-free nut cheese (http://www.rawmazing.com/raw-recipe-simple-almond-cheese/) and I am really looking forward to it! The fresh chives from the garden will certainly make these profiteroles a huge success!! Thank you for sharing the inspiration!